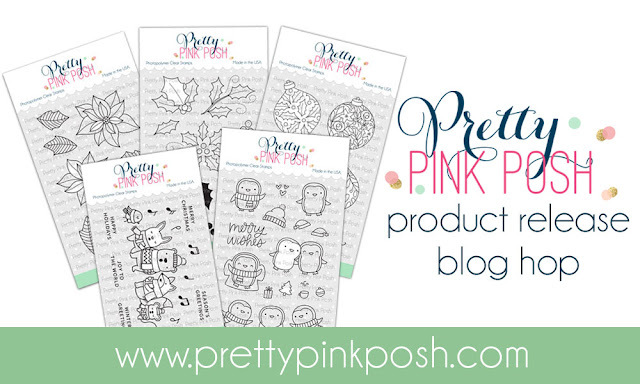 Hi friends and welcome to the Pretty Pink Posh Product Release Blog Hop for November. Today is Day Two of a whole lot of inspiration from the team and guest designers and I'm so excited to be joining in today. There will be an opportunity to win four $25 gift certificates to the store (two for each day). That's a few opportunities, so don't forget to comment on each persons blog each day! Comments must be left by 11:59 PDT on the 20th of November and then winners will be announced on the Pretty Pink Posh Blog. Here are a list of all the participants for today of the blog hop, but be sure to check out yesterday's hop in case you missed it. Now that all of those details are out of the way, let's move onto the project I made. I used the Penguin Pals stamp set for today's project to make a penguin tree. I do this every year without fail and these penguins were just screaming to be made into a Christmas Tree, so that's what I decided to do. To start off my project today I stamped, coloured and die cut out all my penguins and accessories. Then I used the 'Merry Wishes' sentiment that I previously cut apart and white heat embossed it onto a piece of watercolour cardstock. Next I used Tumbled Glass, Salty Ocean, Blueprint Sketch and Chipped Sapphire to ink blended over the background. I then flicked on some water and dried it off with a heat tool. I then added foam tape along the backs of all the images and adhered them into place adding their little hats as well. Lastly, I used the new Berry Bright Confetti Mix and sprinkled some around my project. Thanks so much for stopping by today, the next person on the hop is Jessica Frost-Ballas. Make sure you leave comments as you go to be entered into the giveaways. cutest tree ever, love this! That penguin "tree" is seriously adorable! Love that the penguins are stacked like a Christmas tree!so adorable! What a darling and CLEVER penguin tree! Smart idea. Love... penguins. TFS. Adorable! Love the idea of stacking them for a tree. Oh my!!! What cheerful card!!! It's penguin tree! Lol. So adorable!! If this doesn't get you into the spirit, there is something wrong. So very adorable and your beautiful background makes it perfect. what a fun card! Thanks for the inspiration! Love this happy and colorful card, Eloise! Your penguin tree is amazing! Love the colors, and of course, it's TOO CUTE! super card - LOVE the gorgeous blue background!! That blue background is so nice. What a fun tree! Well who wouldn't love a tree made out of these sweet little penguins? I think it's awesome! Your blue background is simply stunning. I try and try but it never turns out that well. Your penguin tree is awesome!! You are right, they needed to be made into a tree and while I was sitting here reading this, you gave me an idea for some reindeer. Thanks for the inspiration!! Very sweet, what a cute idea to stack these penguins like that! Awesome idea to use the penguins to create a tree. Looks cute! Great penguin tree!! I am into trees and ornaments this season, and this tree is wonderful! Penguin pyramid is super cute. 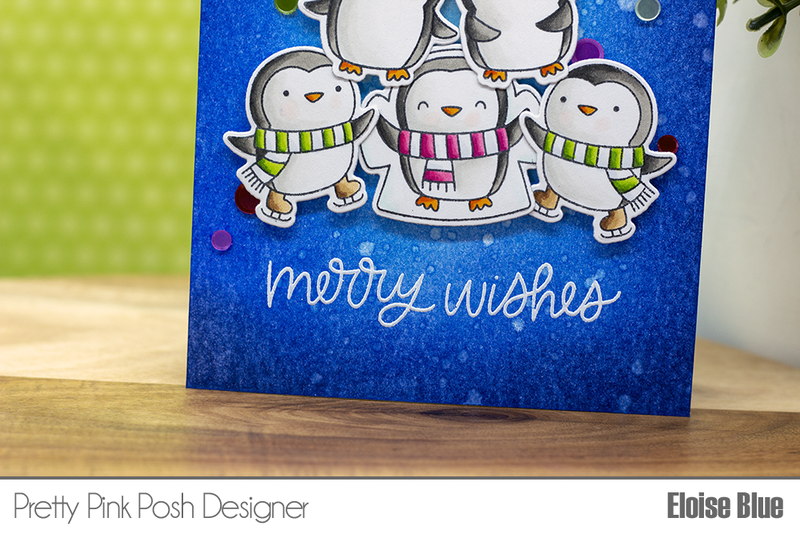 Oh Eloise, your penguins on your card are so cute ! Beautiful coloring, great job ! Your penguins are the cutest, love that it is a tree! Oh.... I like this card very, very much. There's such a beautiful glow in the center of the background. It is very inspirational. Great coloring on your adorable penguin tree! Great Penguin Tree! Love your coloring!! Love your penguins! So cute. Wow, that vibrant background is awesome! It so wonderfully showcased that adorable pyramid of penguins. Love it! Love your adorable penguin "tree". Pretty background, too. Well you can't get much cuter than a penguin tree! Love all the sweet images and how you've stacked them up. The dark blue background shows the penguins off quite nicely. AWWWWWW it's a pyramid of penguins! How adorable! I love all the beautiful colors! I also really love your deep blue background it just looks so good behind the penguins! Super cute penguins,adorable tree. Never thought of stacking small stamps to create tree. How fun is t his card! Your Penguin Pal Christmas tree is so festive and sooooo adorable!! Absolutely beautifully colored!!!! Very cute arrangement of these adorable penguins to create the tree! Super cute card!! I love those adorable penguins! 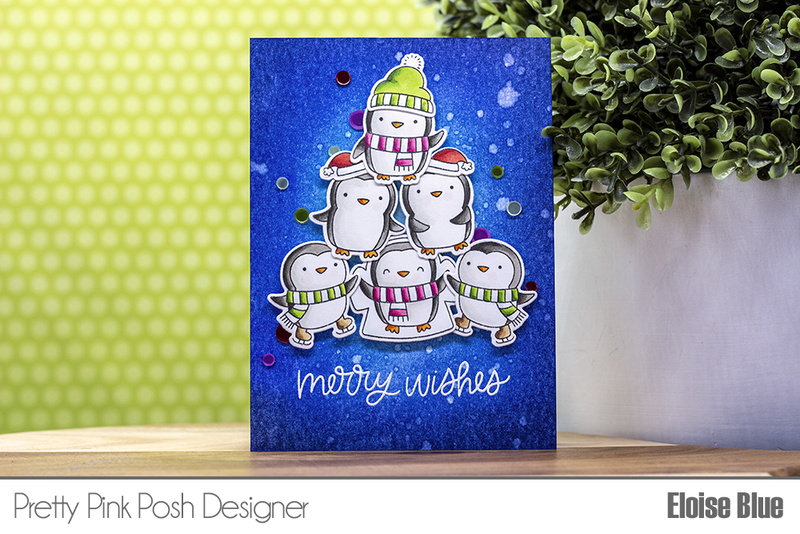 Fabulous coloring on this adorable card! Love these cute penguins! This penguin tree is so cute! What a great idea. 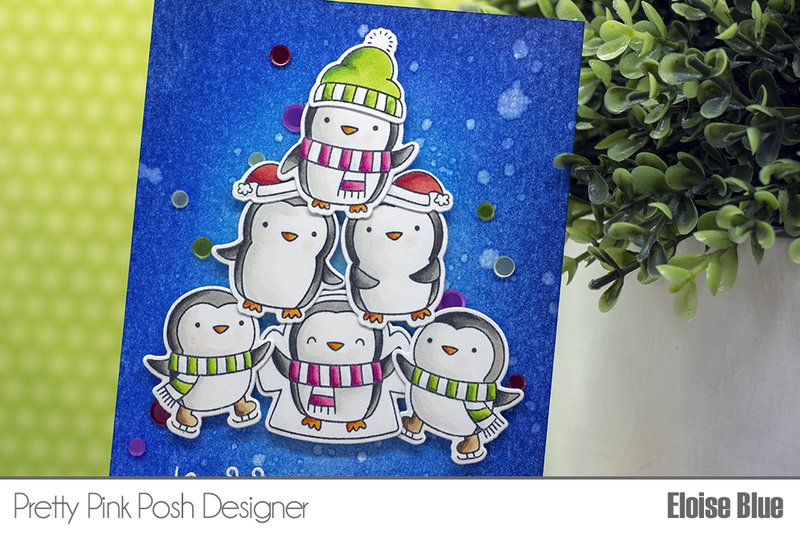 ADORABLE penguin pyramid and awesome coloring! What is better than one penguin? A bunch of them! So cute! This is adorable! I love penguins, and this is such a cute idea! So fun and festive! Those penguins seem to love being stacked on top of each other! Love the way you stacked them to make a tree! So adorable and I just love that beautiful blue background! it's a PENGUIN tree!!! they're getting into the spirit of the holiday!!! I love this pyramid of penguins! And they pop right off that beautiful blue background. Thanks for sharing such an adorable card with us! Oh, this is so adorable!!! And such a great idea! A penguin tree! So fun!